This brittle is a whimsical twist on the traditional pecan pie and is a great addition to any holiday get-together. 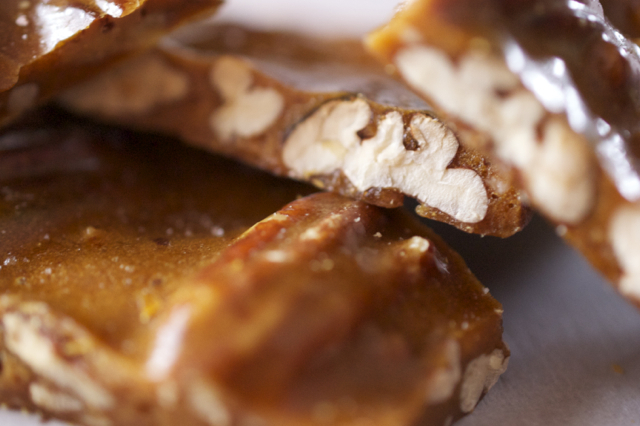 It is homemade, easy, and is sure to satisfy anyone’s sweet-tooth. Plus, it can easily be a substitute for a pecan pie this holiday season… after all, how many pies can one eat? Well, if you are like us, you could probably eat pies until you turn blue. Mmmm, blueberries… However, we do have to agree that this brittle is a fantastic addition to any desert menu, and it’s great for snacking! 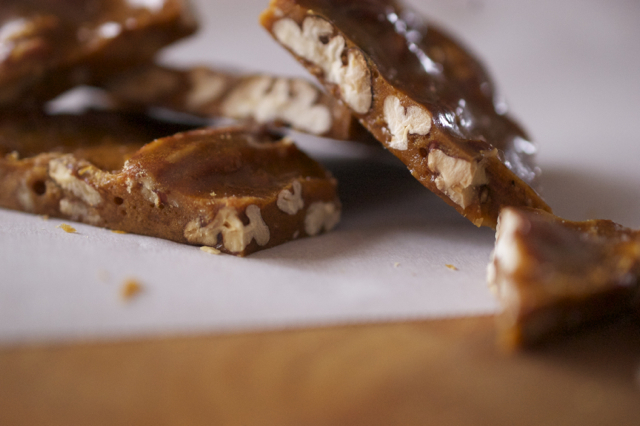 Also, if you are so inclined, this pecan pie brittle makes a great gift for any host or hostess… that is, if you happened to luck out this year and will not be hosting everyone at your house! If pecans are raw, preheat oven to 400°F and spread pecans on baking sheets in one layer. Roast for 10-12 minutes or until the pecans become fragrant and you can hear them "sizzle" when you open the oven door. Set aside and allow to cool. Prepare 2 baking sheets with parchment paper or silpat. In a large saucepan combine corn syrup, sugars, and water on medium heat until sugars are dissolved. Increase heat to medium high and bring to a boil. Cook until about 240°F on a candy thermometer ("soft ball" state). If you do not have a candy thermometer bring to a boil and allow to boil, mixing continuously, for about 10 minutes. Add pecans and butter, be careful because the hot sugars will bubble when the butter is added. Continue to cook on high until it reaches 305°F "hard crack state" on the candy thermometer, or for about 10-15 minutes more if you do not have a thermometer, mixing continuously to avoid burning pecans on the bottom of the pan. Remove from heat and add vanilla and baking soda, once again be careful contents may bubble when vanilla and baking soda are added. Mix until combined. With a buttered wooden spoon, or silicon spatula, divide candy between the prepared baking sheets and spread as thin as possible, working fast as it will harden quickly. Sprinkle sea salt evenly over cooling brittle. Allow to cool completely and then separate from the parchment or silpat. You can either chop the brittle with a knife or drop it multiple times on the baking sheet until your preferred size candy is reached.